This program for international exchange students focuses on acquiring Japanese language skills and gaining knowledge about Japan from a global perspective. It offers a wide variety of classes categorized into the two following courses: Global Japan Studies Course (GJSC) and Japanese Language Course (JLC). The Japanese Language courses (JLC) offers Japanese language classes on various levels – from beginner to pre-advanced. With the maximum of 12 students in a class, the courses are characterized by thorough support and supervision provided to students by well experienced and highly qualified Japanese language instructors. By taking advantage of being immersed in the Japanese learning and living environment, students taking the Japanese Language Course can rapidly expand their Japanese language proficiency. The Course aims at fostering international students who are able to think from a global perspective by reflecting on their own culture and language through acquiring knowledge about Japanese culture and society. The JLC courses are composed of core language classes and applied skills classes. The classes are offered on six proficiency levels from beginner to pre-advanced and in three styles of intensiveness differing in number of classroom hours/week. In the Global Japan Studies Course (GJSC), international and domestic students alike deepen their understanding of the global society from two angles – Japan from the World Perspective and the World from Japan’s Perspective – with the purpose of utilizing what they have learned in their future careers. The GJSC classes can be categorized into two thematic blocks: language and culture, and business and society. 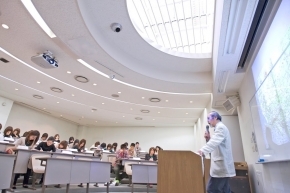 These classes offer a wide variety of topics focusing on the historic heritage and traditional culture of Central Japan and the Tokai Region with its center in Nagoya, as well as the technological innovation and corporate management in the local manufacturing industry with Toyota as its most prominent example.